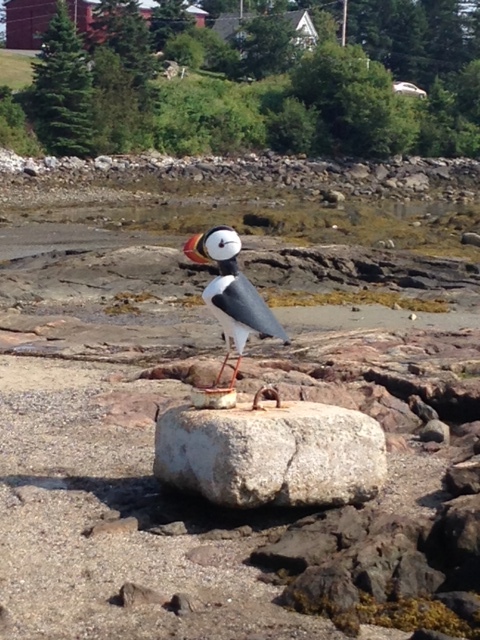 I spent a few days in Maine last week, and as wonderful as it was, I felt agitated. We spent the days outside enjoying beautiful ocean views, lobster rolls, and picturesque harbor towns, and then in the evening, we returned to our cottage, turned on the news, and were stunned by the images on TV. Like many people, I felt off balance. Were the words “very fine people, on both sides” really being spoken by the person who is supposed to unite and heal our country? When school opens, Inly’s students will be welcomed to the library with a display of new books that are beautiful and inspiring. Libraries are the perfect places to start conversations, share knowledge, and engage with an increasingly diverse world. These are hard days, but I am grateful for the opportunity to put good words in children’s minds and hearts. My days in Maine were full of inspiration. We spent an afternoon in Damariscotta, Barbara Cooney’s home until her death in 2000. A quote from Miss Rumphius greets you at the entrance to the children’s garden at the Coastal Maine Botanical Gardens. It reads: You must do something to make the world more beautiful. The gardens are amazing – worth a trip to Boothbay. And so many book connections! Among other delightful features, the children’s garden has a story barn which includes books about Maine and the outdoors. We also stopped at one of our favorite bookstores, Left Bank Books in Belfast. 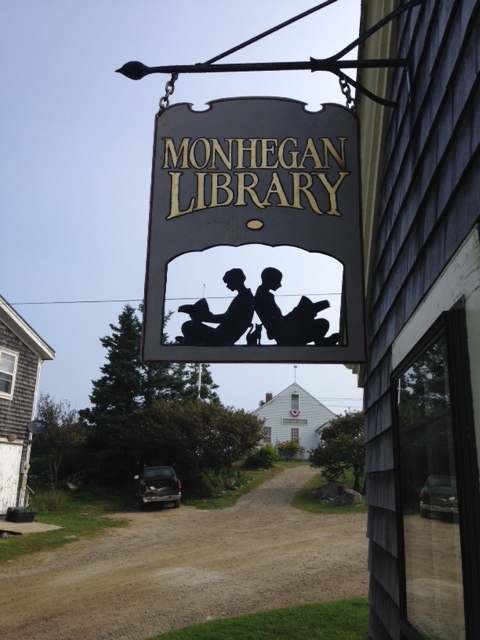 After seven days of traveling through Maine – from the LL Bean store in Freeport, to Acadia, and then to Lubec, the easternmost town in the United States, and finally to Camden – I am back with lots of book-related pictures to share. Lots of miles. Breathtaking scenery. A literal breath of fresh air…. Beginning with our furthest point: Acadia National Park, where there is a calendar-worthy scene at every point on the road. We took walks on the carriage trails, learned about the Wabanaki people who were the original inhabitants of the land, and enjoyed the famous popovers at the Jordan Pond House. 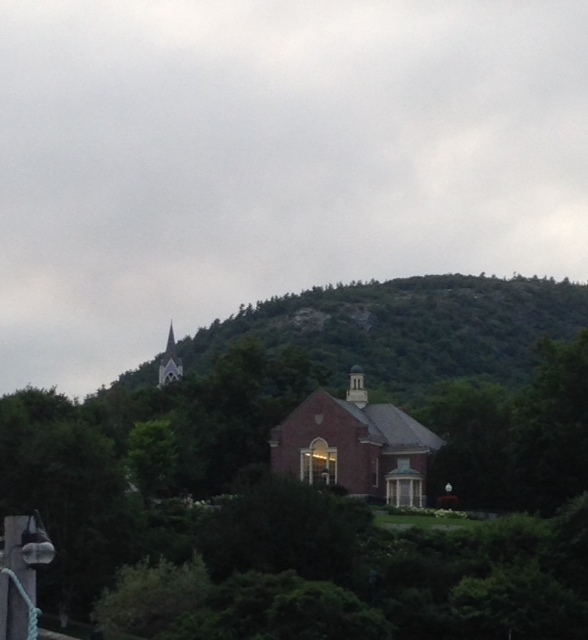 A friend suggested that we stay in Southwest Harbor, away from the t-shirt shops and congestion of Bar Harbor. 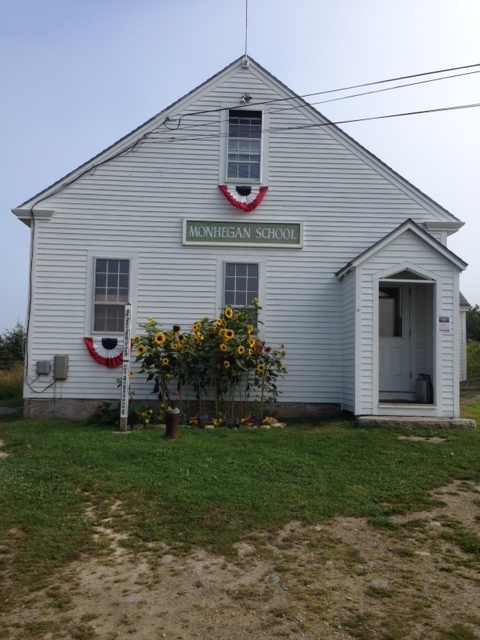 It was an excellent recommendation, but our favorite store was in Northeast Harbor, an even quieter village. Our travels took us as far as Lubec where we crossed the Franklin Delano Roosevelt International Bridge to Campobello Island to visit the “cottage” where Roosevelt spent summers as a child and young man. Before the “international” part of our trip, I went to the Lubec Library which, judging from the busy circulation desk and computer stations, is clearly an integral part of the community. 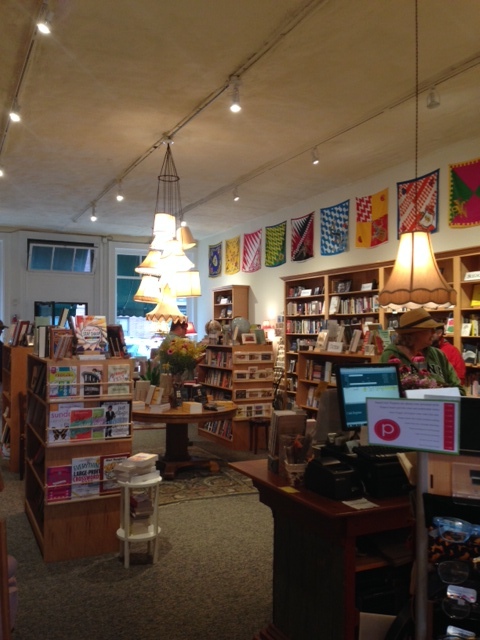 Next stop Rockland where we visited hello hello, one of my favorite independent bookshops. There’s an excellent coffee shop in front of the building which you walk through (after getting a yummy drink) to reach the store. This was a lucky visit. Lacy Simons, hello hello’s owner, was working and we had a fun time talking about our favorite books. She even persuaded me to read Elizabeth Gilbert’s new book, The Signature of All Things, a book I avoided because of my less than enthusiastic response to Eat, Pray, Love and my concern that it would be too much like State of Wonder, by Ann Patchett, which I loved. While in Rockland, it’s a quick drive to see the statue of Andre the Seal in Rockport Harbor. Andre is the star of several books, including this one: On the way back, we visited another favorite store, Left Bank Books in Belfast. It is one of the best curated stores on my unofficial lifetime bookstore list – a place where you could sit in a comfy chairs, ask someone to choose any book from the shelf, and be confident that it will be a good one. 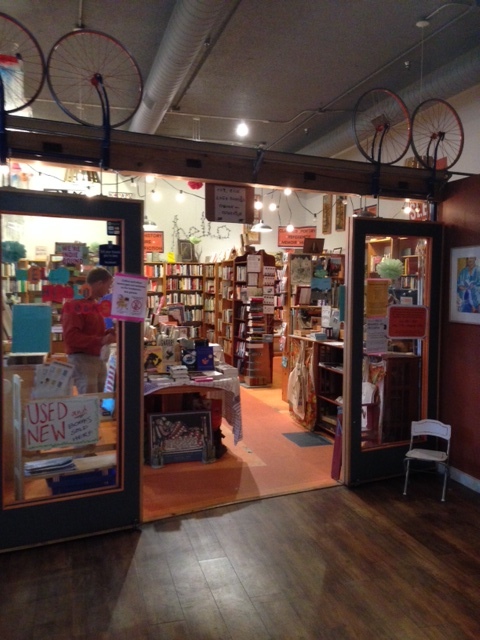 The store feels good – key to the bookstore hopping experience. I never want to leave, but when I do, it’s always with a bag! A few more pictures to share…. We saw this giant blueberry on the side of the road and pulled right off the road! As you can guess, the store sells blueberry jam, mugs, t-shirts, dish towels, and about a hundred other blueberry-covered things! This girl was selling seashells that she found on the beach. She is going into 5th grade, and as I selected shells to buy, I asked about her favorite book which is —- Charlotte’s Web! She told me her favorite scene is the one where Templeton finds the goose egg. It kind of made my day! Another book I purchased in an antique store, mostly for the fun of reading aloud as we travelled. This is a book published in 1923 by the French’s Mustard Company, which includes “a word to American housewives on the Art of Cooking.” The first line reads: “To American home cooks, may I not send my felicitations on your cookery.” After reading that line, I was sold! But….I think the cover is graphically interesting. Look at the woman’s dress and how there is no delineating line between her and the background. Finally, I saw this book in an antique store in Maine and paid $2.00 for it because of this two-page spread. This would have been my childhood dream — and it’s come true! 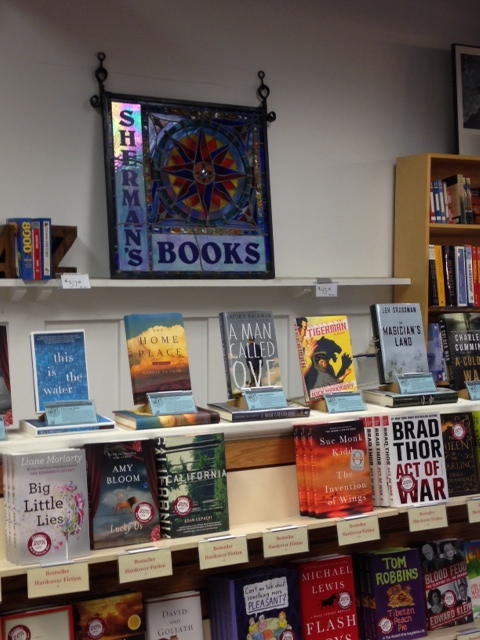 Bookstore Hopping Through Midcoast Maine…. 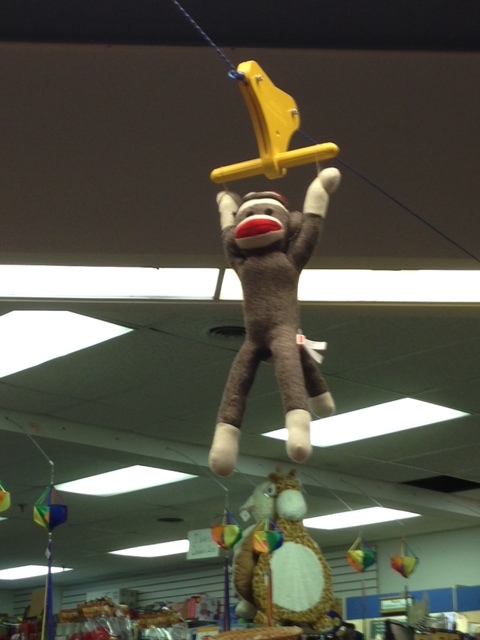 It was while browsing in Sherman’s that we heard the sad news about Robin Williams. The man working that evening saw it on his computer and let us know….the feeling of sadness and shock was palpable. All of the customers hoped it was a mistake until everyone’s phones began buzzing with the news. On a happier note, we bought a book about the best lobster rolls in New England for a friend of ours who will drive many miles for a good lobster roll. One of the highlights of a trip to Camden is spending time in their beautiful public library. I want to apply for a job there, but only for the summer months. As a person with a serious snow-phobia, I don’t think Maine is the right direction for me to move. 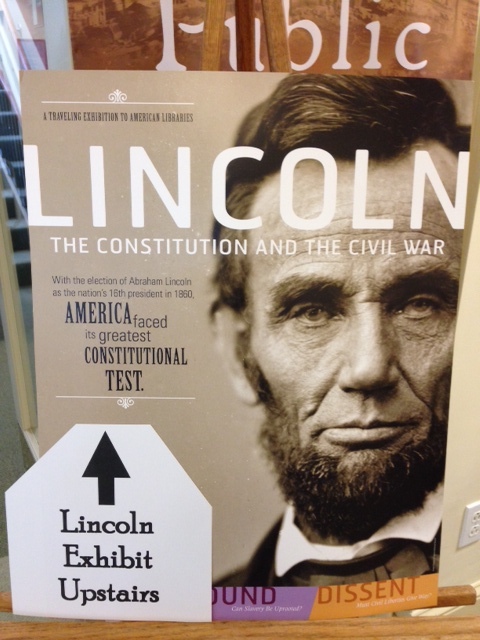 This summer the Library is hosting an exhibit, Lincoln: The Constitution and the Civil War, as part of their Maine and the Civil War programs. It was interesting to be in a place with no paved roads or commercial activity. There are a few small stores, one hotel, and we saw two trucks on the island, but that’s about it. It truly felt like we had stepped back in time. Of course, the tourists taking picture with their phones kept the 21st century firmly in place, but it was fun (kind of) to imagine living in a place with no Starbucks! 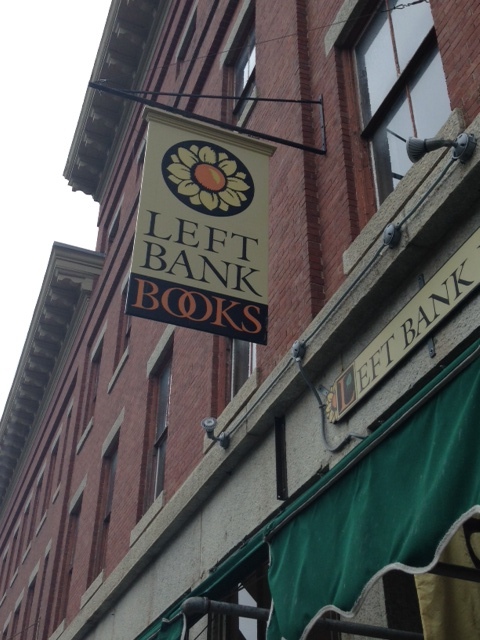 The highlight of our bookstore visits was in Belfast, Maine where we discovered Left Bank Books. It is the perfect bookstore: cozy, warm, in a beautiful place, well edited, and a knowledgeable staff – well worth the visit if you have reason to be in Belfast or any town within an hours drive. We poked around for awhile and, of course, left with a bag full of books. Admittedly, I spent most of my time in the children’s section eavesdropping (for research purposes) on conversations between parents and kids. Among my favorite conversations were two boys – who looked about 10 – talking about The Giver movie and a sweet exchange between a dad and his daughter about finding a new chapter book to read together. 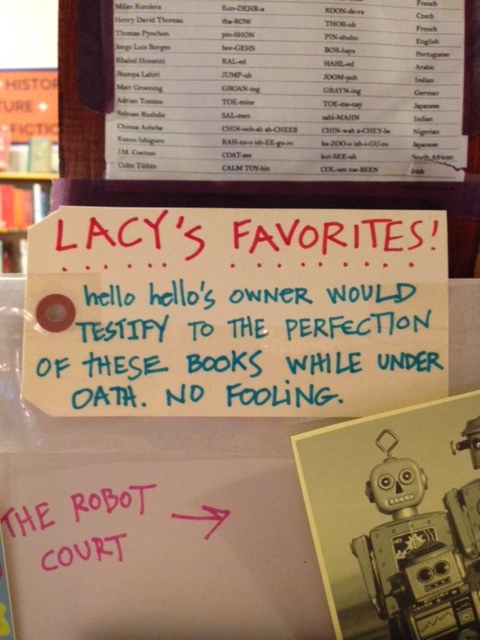 I was especially happy to re-visit Hello Hello Books in Rockland. I love this store because it’s clearly owned by a person who loves books. 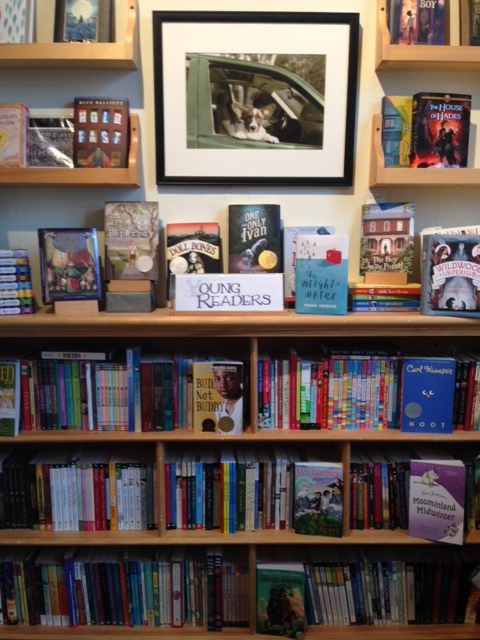 My favorite display is a stack of Lacy’s favorite books – a few of her selections are in the pic below. I share her love for Three Junes by Julia Glass…Hello Hello is connected to a coffee shop. You can order a yummy drink and take it right into the store – the perfect combination! 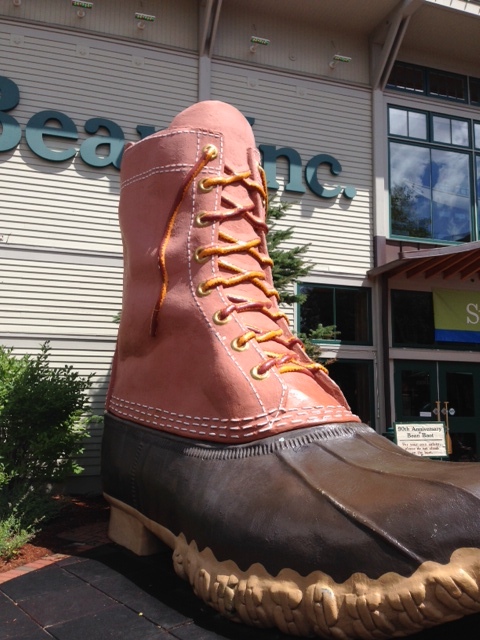 No visit to Maine would be complete without a visit to Freeport and the L.L. Bean Flagship store. I counted this stop as a bookstore visit because they sell a wide variety of outdoor guides at the store, but I bought boots – not books! 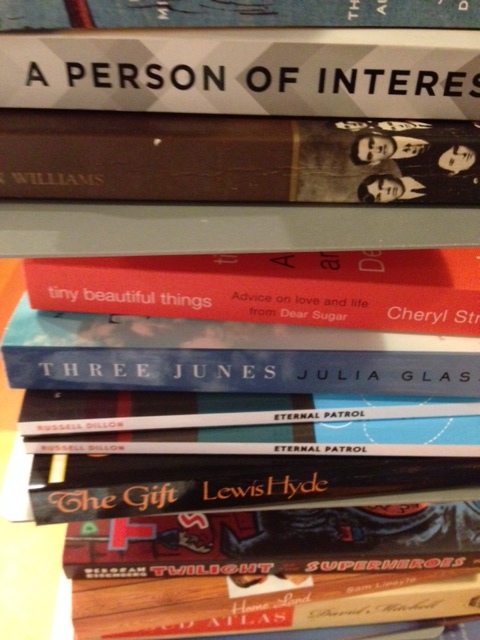 Back at home, but lots of happy memories and new books!